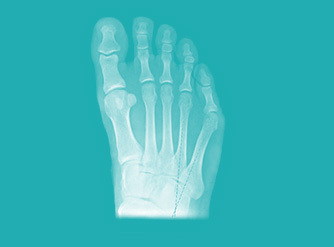 The varus fifth toe appears as a dorso-lateral bowing of the head of the 5th metatarsal. It is usually accompanied by pain, swelling and the varus deviation of the 5th metatarsal, and can also involve overlapping of the 4th metatarsal. This condition is congenital and is mostly linked to a shorter extensor tendon of the 5th toe. One of the main reasons why this condition appears is the use of tight shoes (or narrowed toes or high heels). However, it can also be due not only to hereditary factors, but also to rheumatic or neurological disorders or to another anomaly of the foot (secondary causes). Conservative treatment may include bunion padding, physical therapy or physiotherapy or the use of silicon protectors (orthoses). If these solutions prove to be ineffective, then you need corrective surgery which, in recent years, mainly uses the mini-invasive, keyhole technique performed under local anaesthesia.